This is a spot for everything else I've made. 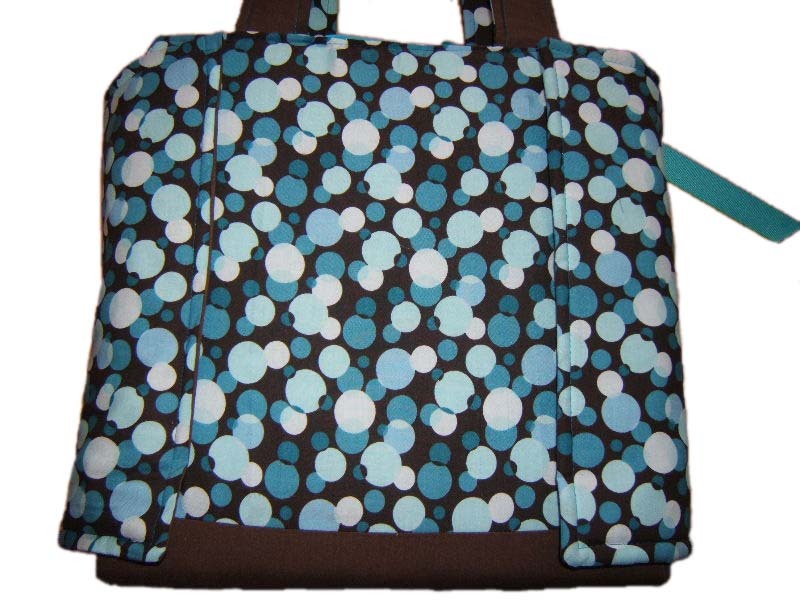 Most are made-to-order items or special requests, and some become a permanant fixture due to high demand. Check back here regularly to see what's new! 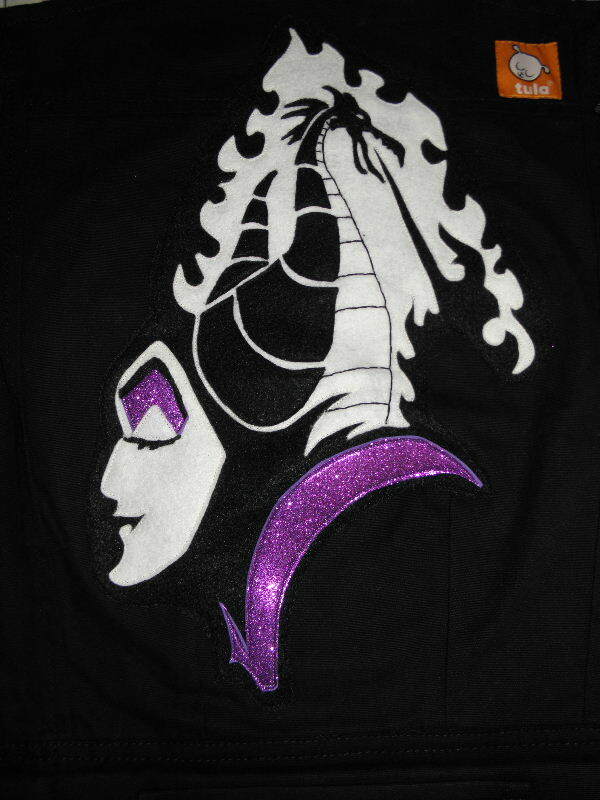 A custom designed Maleficent/Dragon applique I sewed onto a Tula baby carrier. 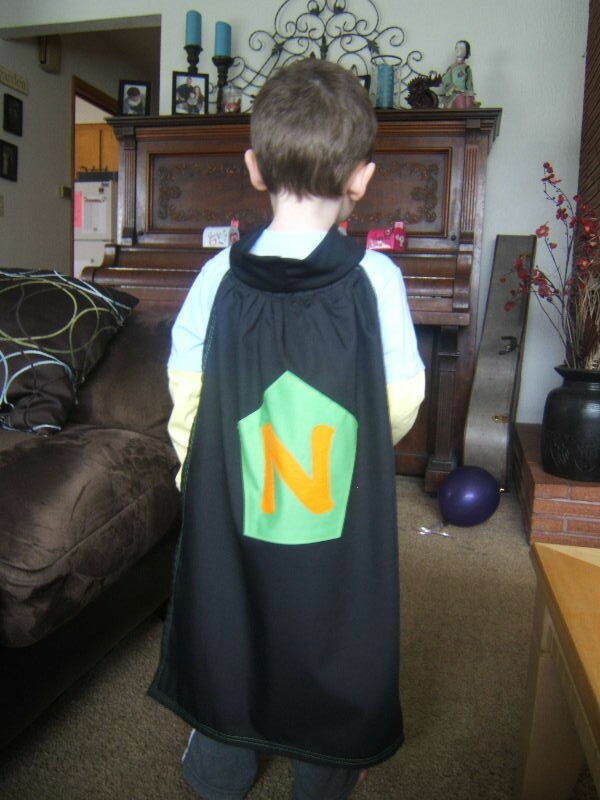 Special order cape for Super Nolan! 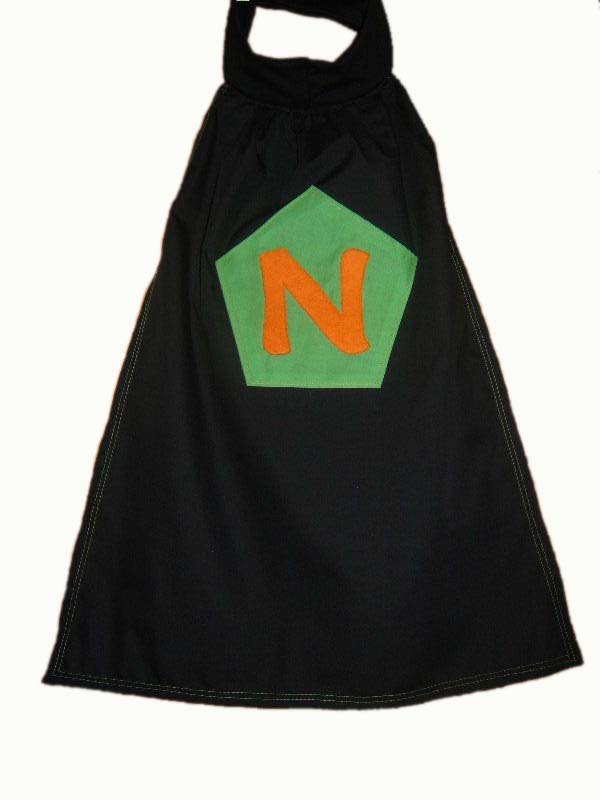 Lime green pentagon shape with large letter "N" in orange fleece. 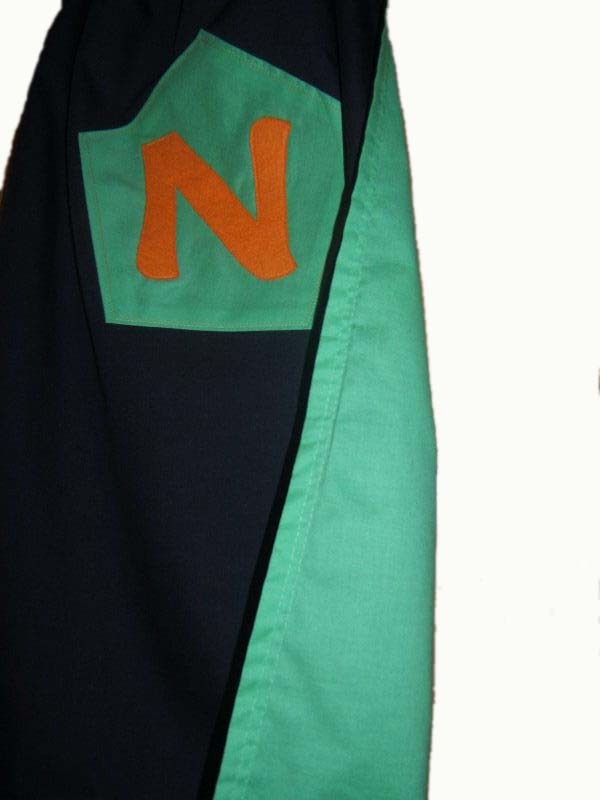 Lime green on the back. 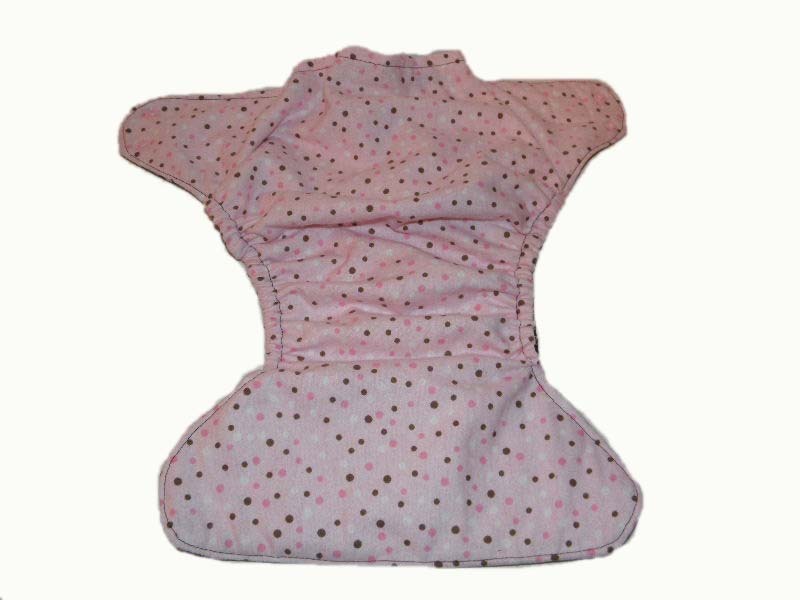 Soft, stretchy jersey fabric for the neck hole. 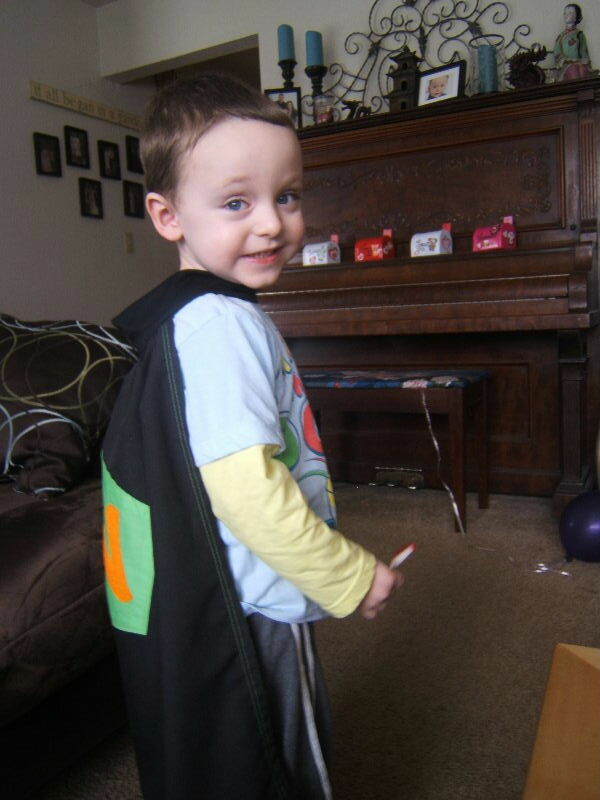 This way, he can get the cape on and off all by himself. 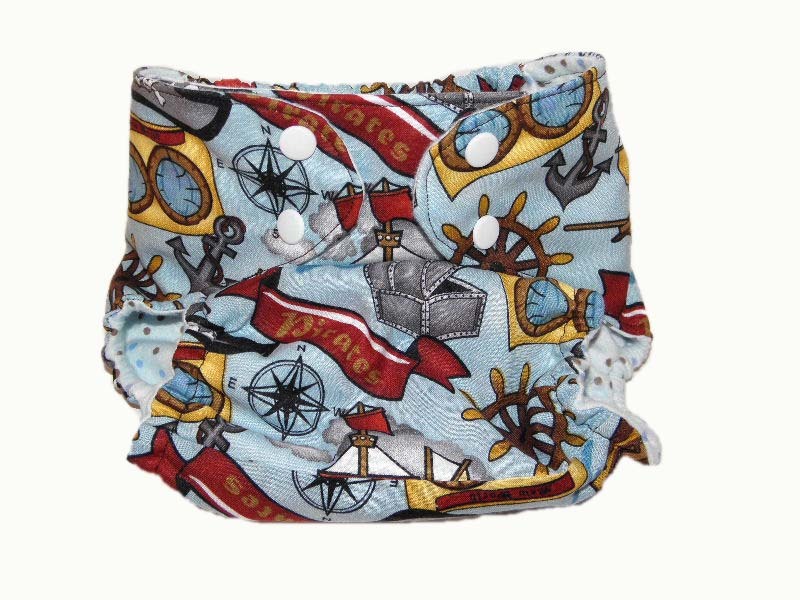 Pirate fabric pocket diaper. 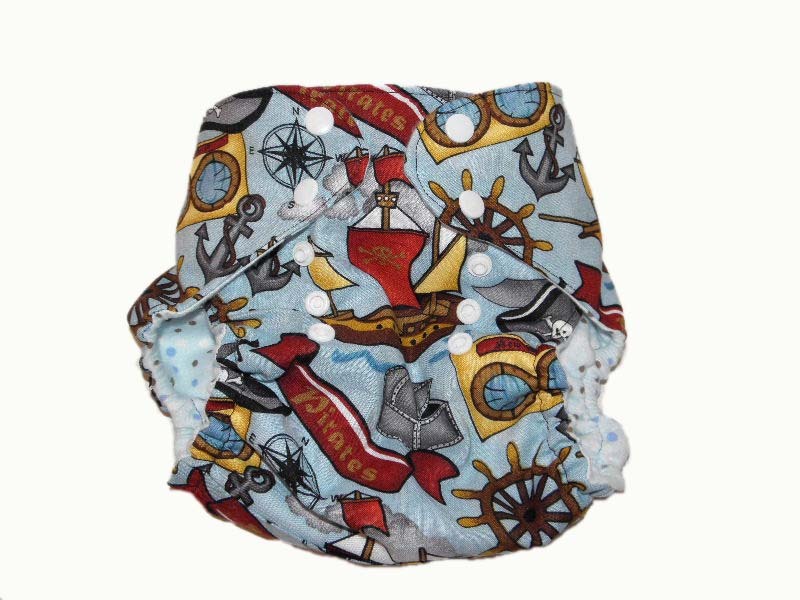 This one has a hidden waterproof layer inside and an adjustable rise for your growing baby. Adjustable rise unsnapped. 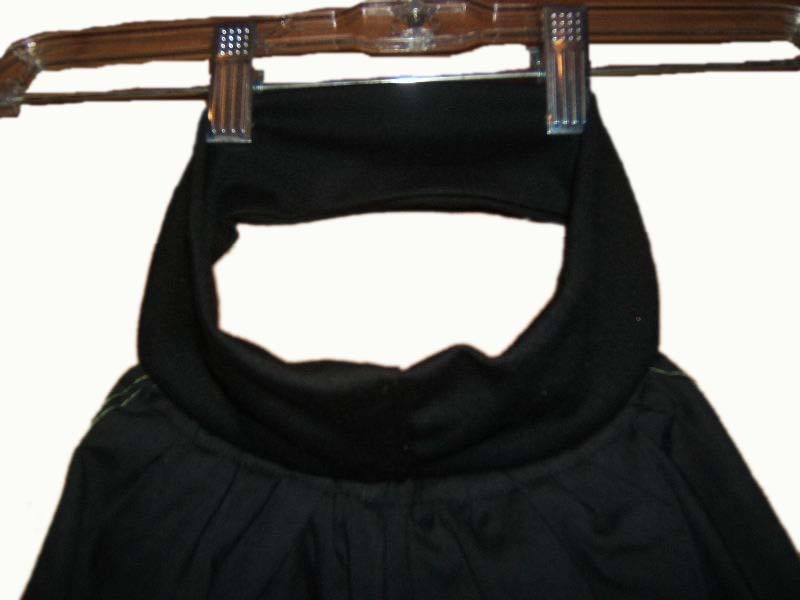 Also has adjustable snaps at waist. Soft, absorbant flannel inside. 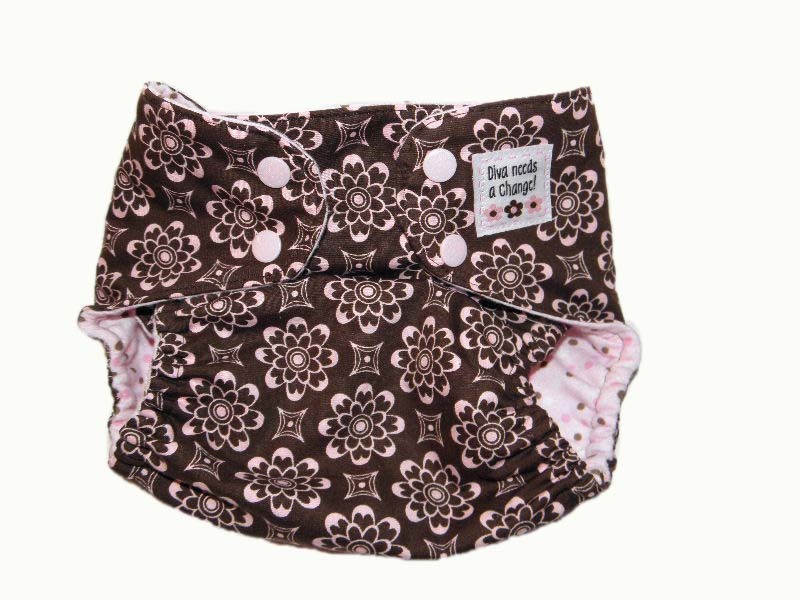 Prefold diapers are tri-folded and inserted into the inner pocket. 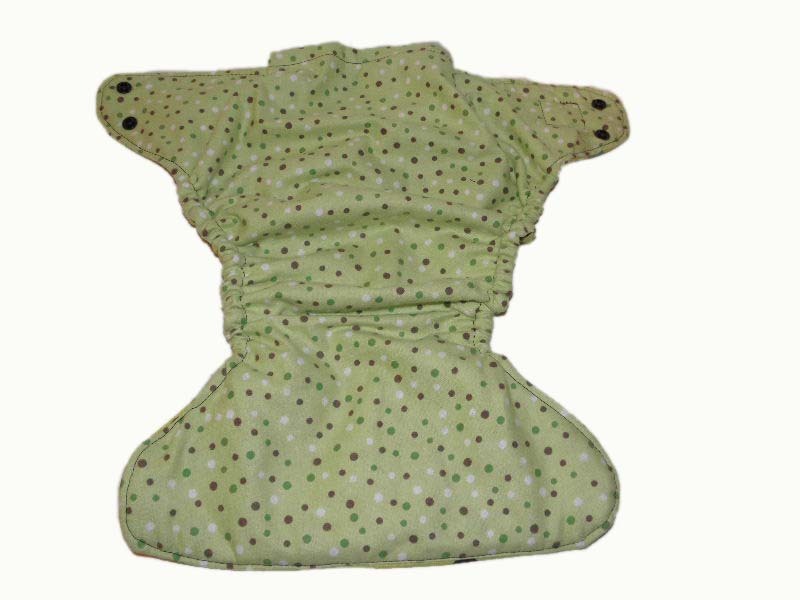 Elastic at leg openings and lower back hold the diaper snug against baby's skin. 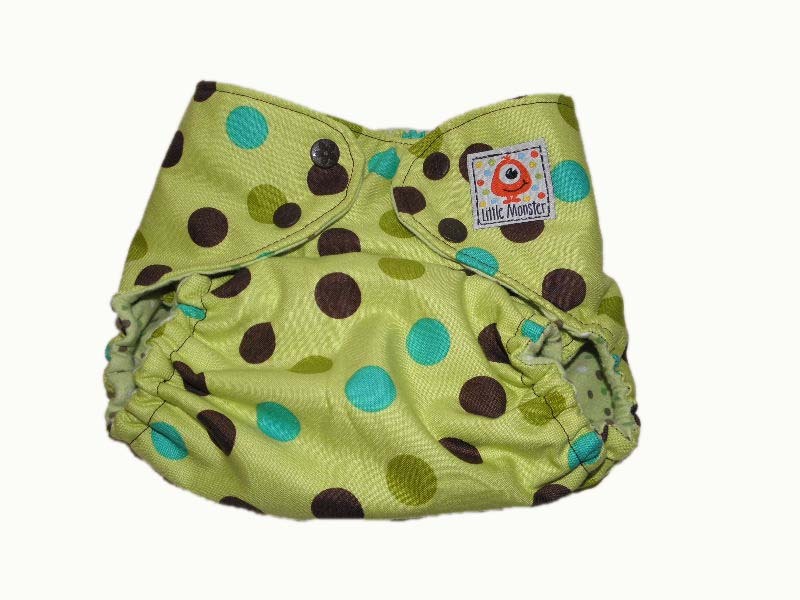 Lime green dots fabric pocket diaper. 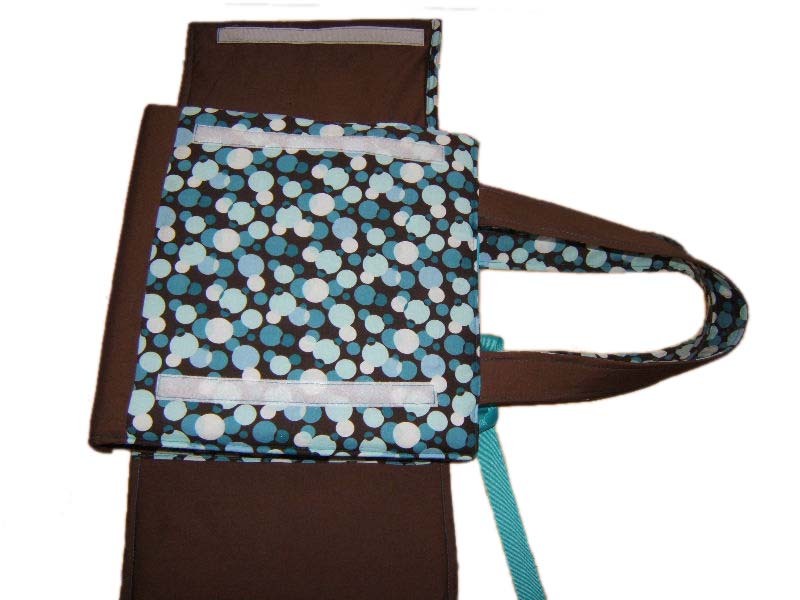 This one has a hidden waterproof layer inside and an adjustable rise for your growing baby. 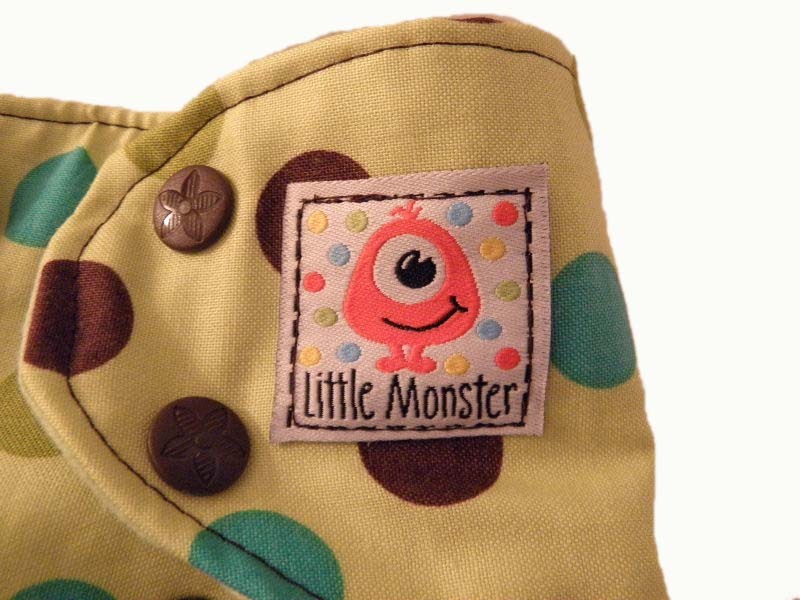 Adorable tag reads "Little Monster". 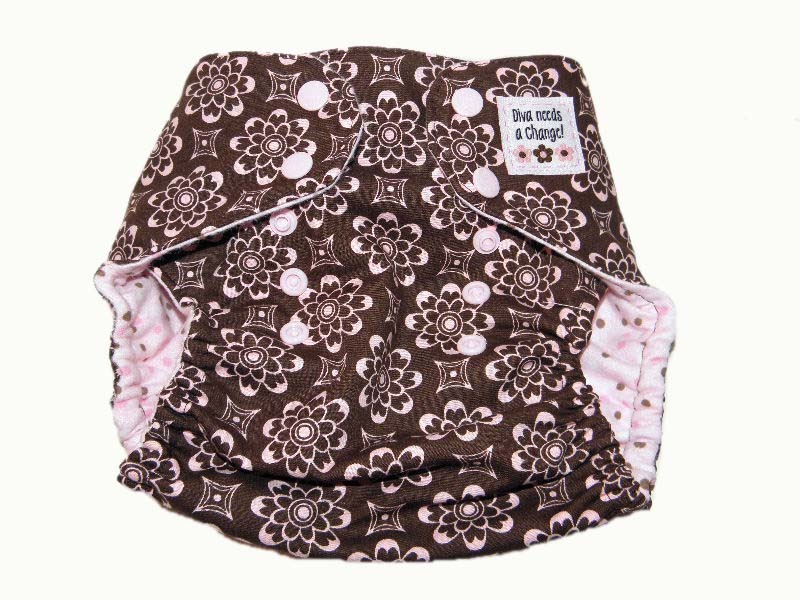 Pink and brown tiles pocket diaper. 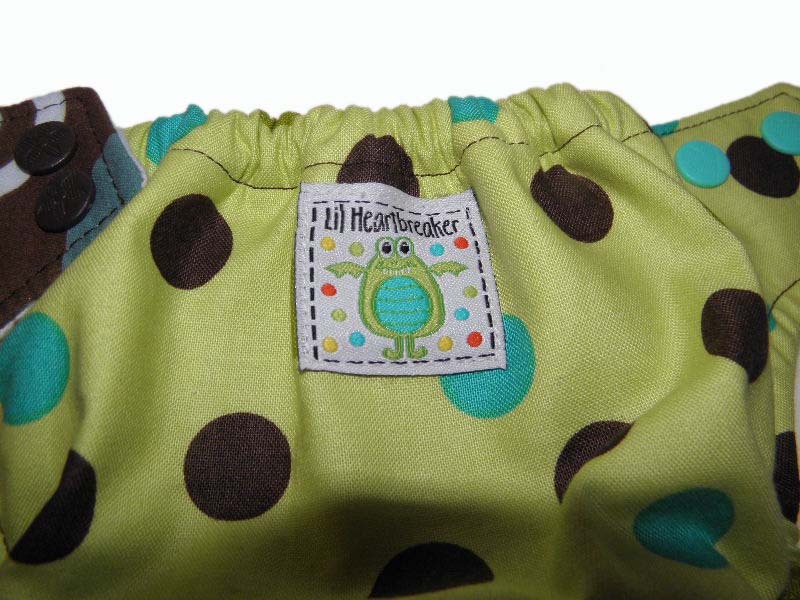 This one has a hidden waterproof layer inside and an adjustable rise for your growing baby. 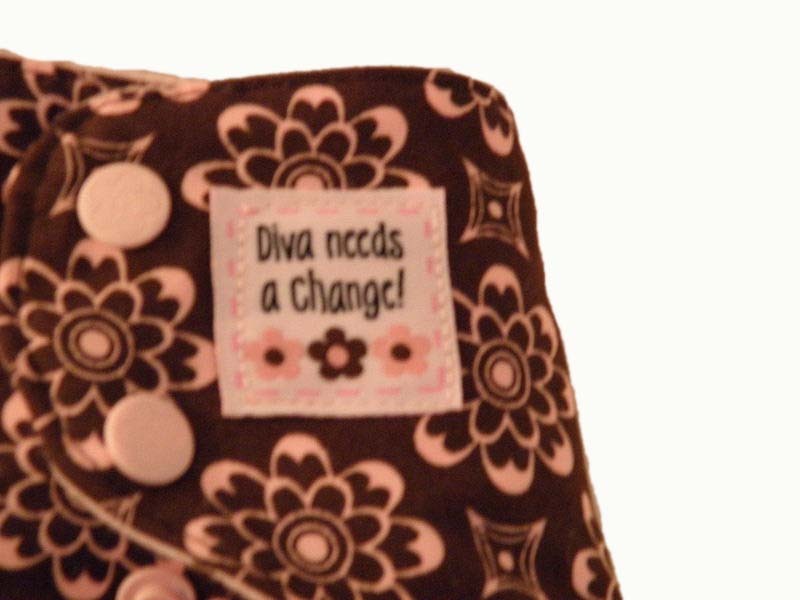 Adorable tag reads "Diva needs a change!" 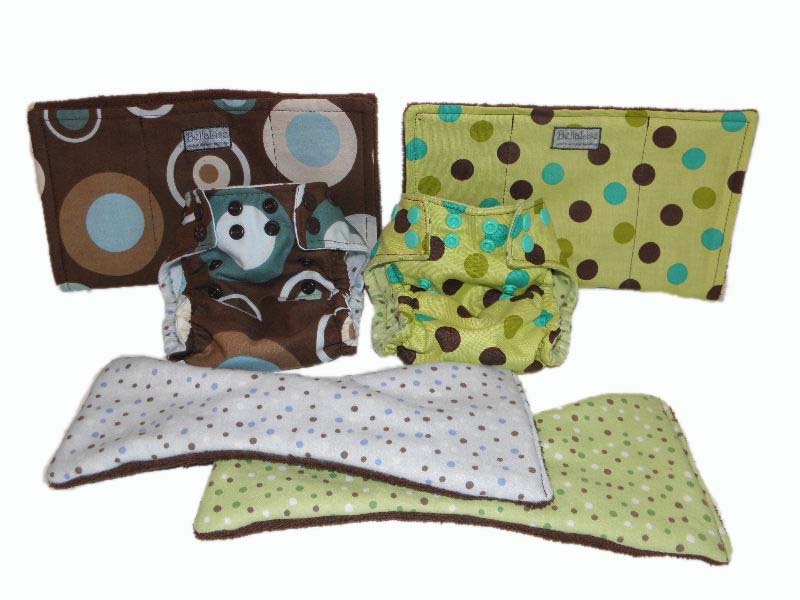 A set of two newborn size pocket diapers, soaker inserts, and burp cloths. 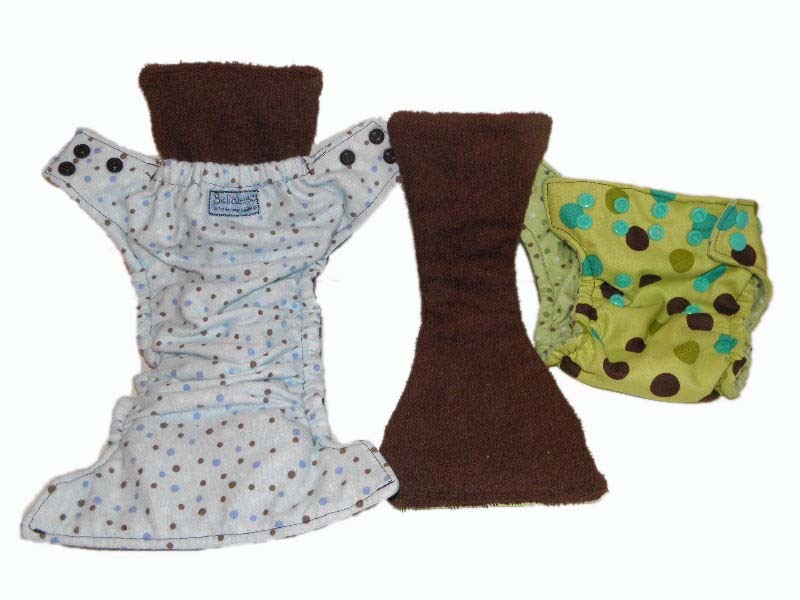 Pocket diapers are lined inside with soft flannel, and soakers are terry cloth on top, with two layers of cotton soaker fabric inside. 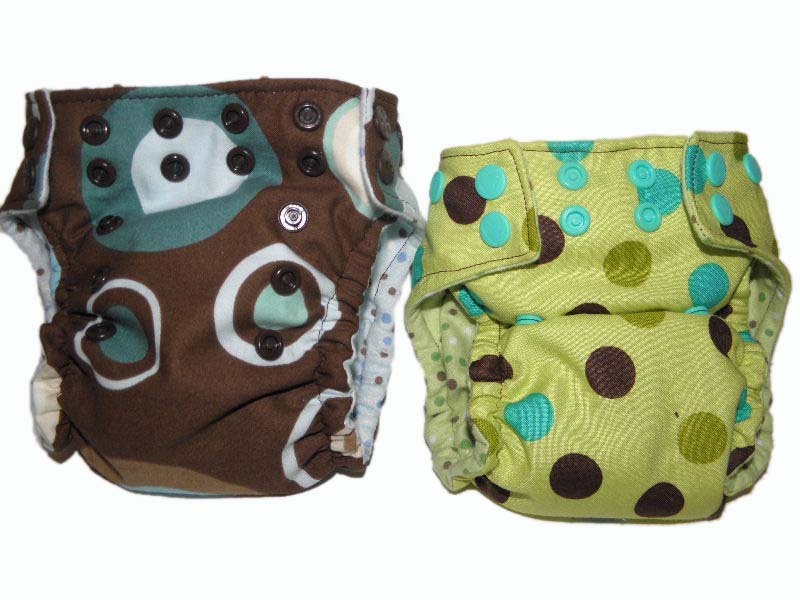 Both newborn diapers side by side. 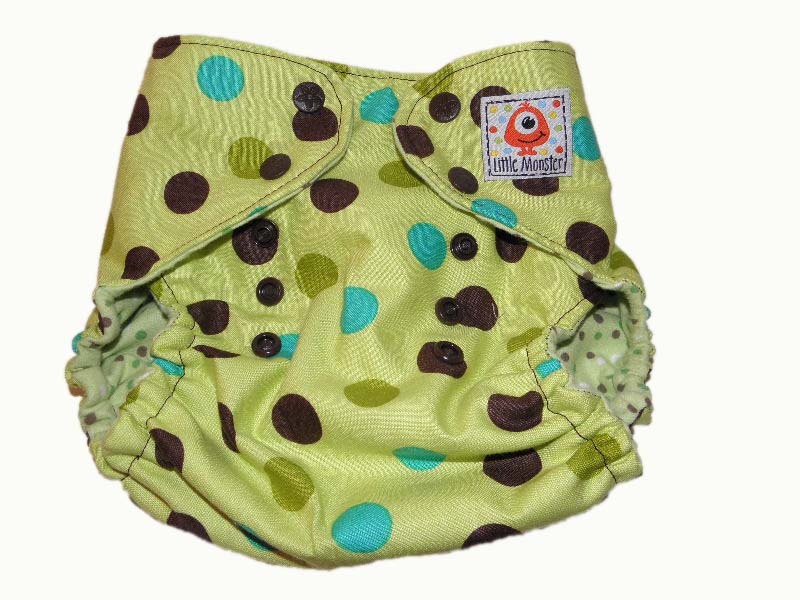 The left diaper is open to the largest snaps at the waist and the middle. 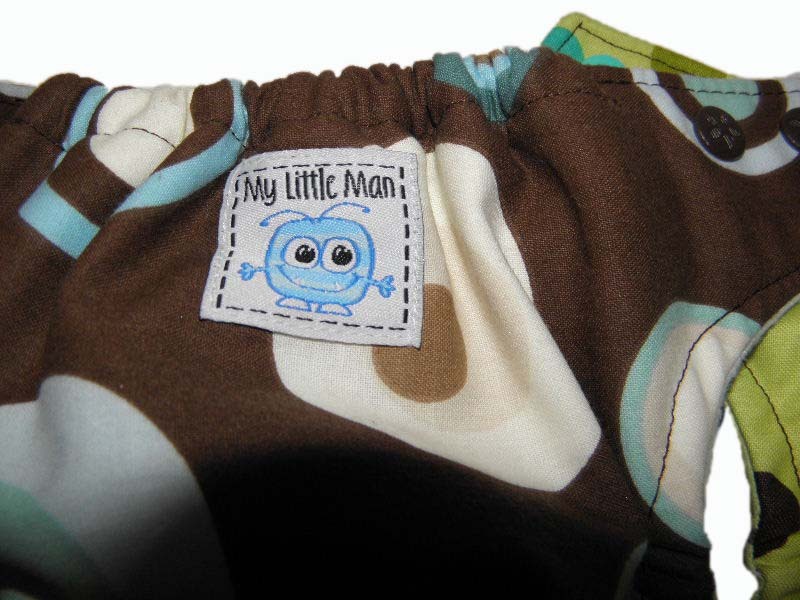 The right diaper is snapped closed at the smallest settings. 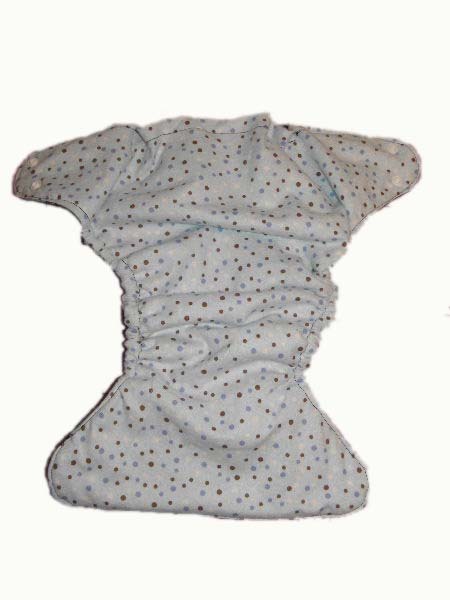 Two burpies with terry cloth on the back. 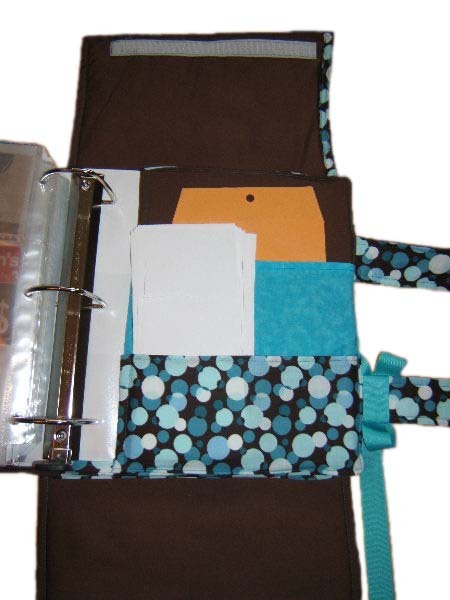 I found a great pattern for coupon binders, but it seemed a little complicated. So I did it my own way, and viola! 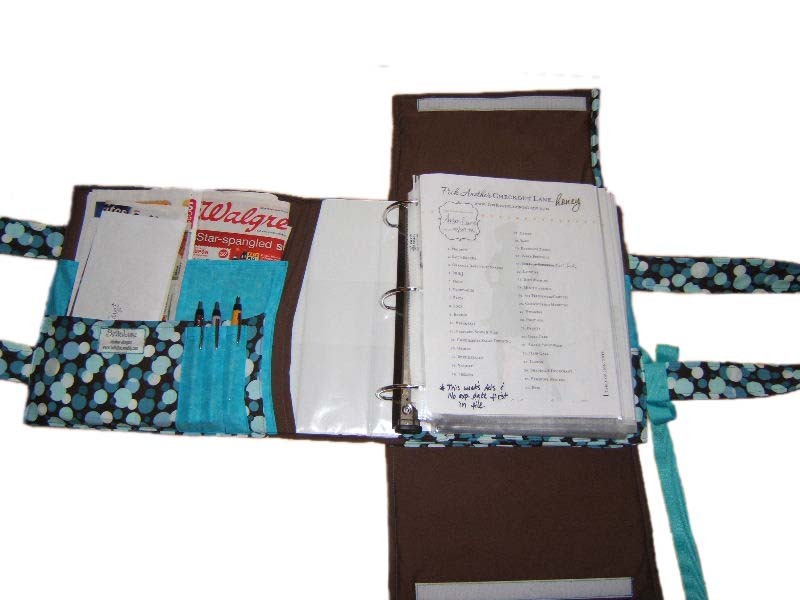 The coupon clipper's dream binder! 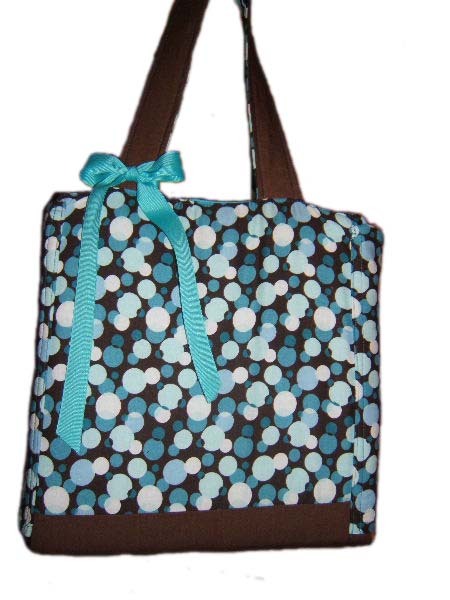 Looks like a bag, but carries all your coupon necessities. 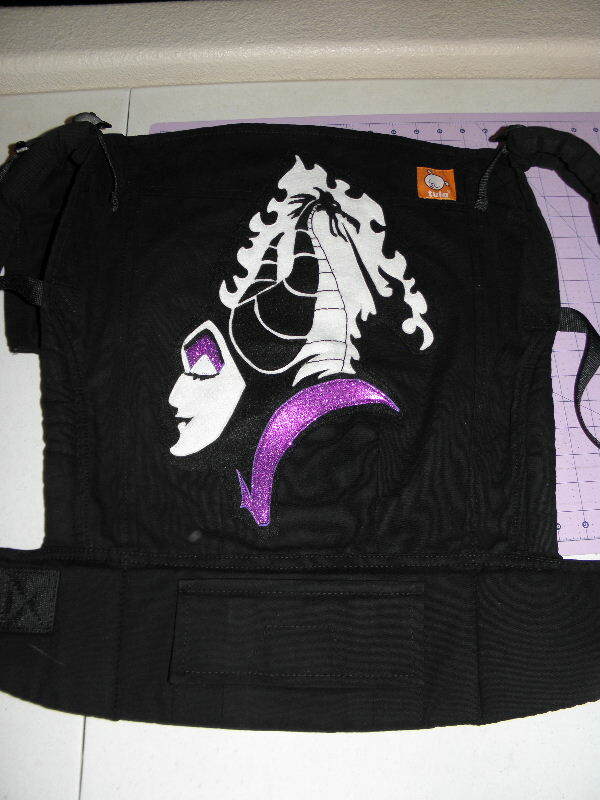 Back has two hook and loop pieces that fold from the front around the back side to keep everything in place. And inside has all your coupons and ads. 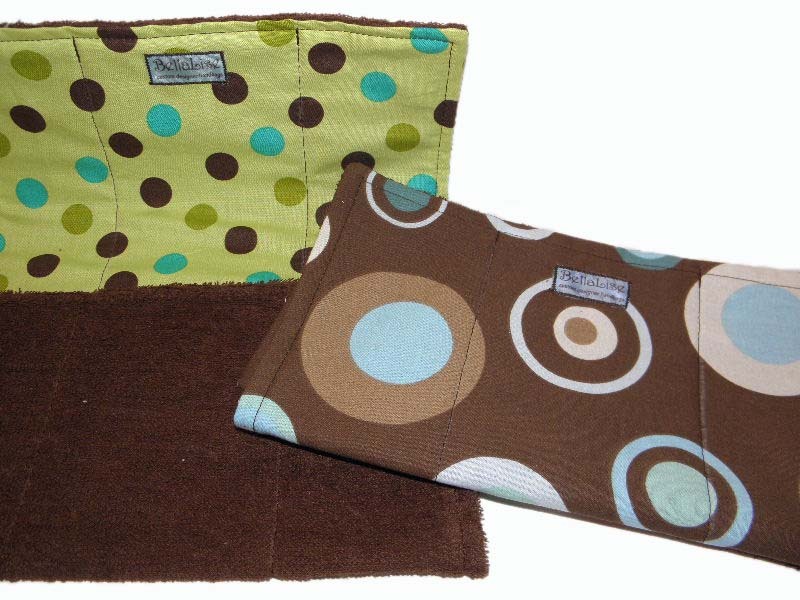 Front has two pockets, and a pen pocket to hold three pens. 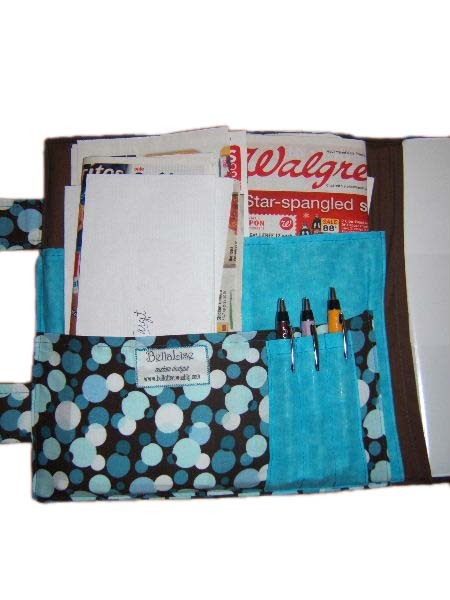 Back has two more pockets for all your other items (I keep my expired coupons, scrap paper for lists, and scissors here).